Many of our clients have begun experiencing BYOD issues, not because they made a policy choice to support or not support BYOD, but because of inaction, regardless of that policy choice. In any WLAN RF environment, these clients are there, consuming airtime, causing interference and you must plan for their existence regardless of your policy stance on BYOD usage. Many have been complacent in dealing with the impact of more mobile devices, and soon it will expand again. Our employees, guests, visitors, and incidental neighbors all have mobile WLAN devices, from phones to tablets and soon WLAN enabled smart-watches. WLAN chipsets have been integrated into so many devices, that even home users are experiencing the crunch as they see device counts increase. To understand the impact of the mobile device boom, imagine a room that originally had 3-4 devices that were talking over walkie-talkies, but now there are also a dozen other devices that key their microphone every 2-3 seconds, which makes the ability to carry a conversation on the supported devices much less probable. So how do we evaluate the impact, find areas requiring adjustments and what adjustments do we make? Almost every WLAN vendor will be able to provide (on a per-radio basis) a measurement of Channel Utilization. The 2.4Ghz spectrum has only three channels (in the US), so in a given space we have to ensure we have no large AP coverage areas which overlap for the 2.4Ghz band, otherwise we end up with a great deal of co-channel interference. If you see Channel Utilization above 5% with no clients in the area, you have too much overlap or an interference source. If you have clients on the APs, an overloaded AP would be any with a sustained Channel Utilization of above about 70%. Due to the half-duplex nature of the media, and the Guard-Interval between transmissions, this is about where 802.11 starts to become unruly. If you are at this level of channel utilization, you then want to look for frame drops to/from the client devices. If frame drops are low, you are just simply using the AP to about its maximum potential. 802.11 does a great job of re-transmitting, but the impact on throughput is significant. If you see re-transmit rates of 35% or higher, you have an area that needs more APs with smaller coverage areas, less clients, or some tuning to free up some airtime. Watch areas that are problematic by sorting your statistical output in tools such as NCS Prime, Aruba’s Airwave or your controllers CLI. Repeatedly appear as areas with High Channel Utilization or frame retry rates. Our common sense tells us we have not enough APs or too many clients in the RF space. A and B are easy to identify, and C is just a gut feel at times based on what the data demands are on your WLAN network . Frequently I’m asked how many clients can an AP/Radio support. That answer is “it depends”, just as it depends how many people can fit in a phone booth. When you’re planning a wireless network, figuring out how many users a wireless access point can host is a very important part of the system design. But, like a lot of things, the answer is complicated. 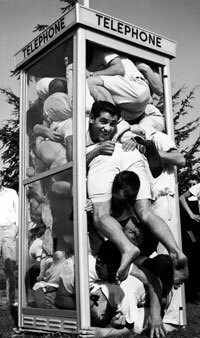 It is kind of like asking “how many people can you fit into a phone booth?” Well that depends on how tall the people are, how much they weigh, their shape and the size and volume of the phone booth. I could put lots of middle school students in the booth versus maybe one member of the Green Bay Packers defensive line unit (my world champion Packers that is). In Fact, the answer to the capacity question is so complex, most wireless hardware vendors don’t quote those statistics on their marketing materials…typically you only see throughput numbers. For most environments it really boils down to a desired throughput level. One vendor has tested how many devices can sustain “just above” 1 Mbps of throughput, and their result was about 42 802.11n devices. If your clients are not expecting jitter-free streaming media (you’re lucky and today rare), you can support more clients. In retail and warehousing applications, we see 60 and sometimes more barcode guns supportable per-AP simply due to the nature of the traffic (buffered/store & forward, low data rates). Now we know we have problems, so how do we fix them? Most of the time, mitigating interference from 802.11 and non-802.11 sources will be a common task. If you see high channel utilization or noise floors when there are no users on the network, then you need to find the interference source or work around it. With the huge proliferation of wireless devices in the unlicensed band, it is no longer obvious what might be a source of interference. Wireless links are now embedded in watches, shoes, MP3 players, and many other tiny consumer devices. In some cases, previously benign devices have been updated with RF technology. Motion detectors, which appear in many offices for lighting control, are a good example. A new breed of hybrid motion detectors uses a combination of passive infrared sensor (PIR) and 2.4-GHz radar to detect motion. These devices, which look identical to their benign predecessors, generate significant interference that can disrupt your Wi-Fi network. Unintentional emitters are also hard to find. A defective ballast on a fluorescent light fixture can generate broadband RF interference that can impact Wi-Fi. This is impossible to identify by simply looking at the device. "Hidden devices" are becoming more common as well. We have seen numerous instances where a security group has hidden wireless cameras, unbeknownst to the networking group, not realizing that they are jamming the Wi-Fi network. A recent study undertaken by Farpoint Research measured the impact of various interference devices on the data throughput of Wi-Fi. At 25 feet from the AP or client, a microwave oven was found to degrade data throughput by 64 percent, a frequency-hopping phone degraded throughput by 19 percent, and an analog phone and video camera both degraded throughput by 100 percent (in other words, no ability to connect). When throughput suffers due to overloading, we have a few simply choices, make the clients find a better place to associate, or reduce the area covered by the AP (sometimes referred to as microcell or picocell coverage models). If in a dual-radio environment you have one radio overloaded, but not the other (2.4Ghz vs. 5 Ghz), most vendors support a mechanism for Band balancing, or Spectrum balancing. Adjusting your coverage area size can be a simply TX power adjustment, but if you rely on mechanisms for dynamic RF adjustments, make sure you don’t accidentally create coverage holes with you adjustments. Make TX power adjustments in very small increments. A 3 dB increase represents roughly doubling the power, which means that 3 dBm equals roughly 2 mW. For a 3 dB decrease, the power is reduced by about one half, making −3 dBm equal to about 0.5 milliwatt or 500 microwatts. Other Adjustments – Eliminate 802.11b clients, eliminate low data rates. The legacy low data rates (1-2 Mbps) carry most of the overhead data (association requests, beacons/probes, etc.) for legacy devices. At these low data rates, they take a very large amount of airtime (up to 12x the time for an OFDM 12Mbps transmission for example). If you have relatively newer client devices you wish to support, you can (we’ve seen improvements of 20-40%) free up significant channel time by eliminating support for legacy data rates. Elimination of the 1 & 2 Mbps non-OFDM rates (and potentially 5.5 and 11 if you have no 802.11b clients at all) will free up airtime significantly, but be aware there may be impact to older clients. Again, I instruct users that if you’re able to free up 10-25% of the channel availability, it’s probably not always going to be your long-term fix. The airtime will be consumed soon enough, so begin planning/budgeting for higher density AP deployments. The migration to 802.11ac will require very dense AP deployments, due to the need for higher receiver sensitivities, to achieve the highest data rates. There are many things we can do to make our WLANs perform at their peak. In early centralized controller models, the “set-it-and-forget-it” promise worked, but times have changed. The influx of devices (802.11 and interferers) has exploded, no two RF environments are the same, and we do have to now begin to “manage” our precious airtime for our users. It may not be something we have to do in all areas of our deployment, but at least some area of your WLAN can be improved by watching, learning and reacting to the usage patterns of that finite resource, airtime.